Pacific City, Oregon (September 26, 2017)—'Roll out the barrel—we’ll have a barrel of fun!' Pelican Brewing Company rolls out the latest in its Lone Pelican Series: Bronze God, Märzen-style Lager or German-style Oktoberfest beer. The deliciously malty lager is available this week in 22 oz. bottles in addition to kegs, 1/6 barrels and on tap at Pelican brewpubs. 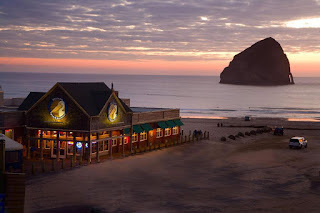 Pelican Brewing Company was founded in 1996 by Jeff Schons and Mary Jones in Pacific City with Oregon's only oceanfront brewpub. Celebrating its 21st year, the brewing company has created masterpieces like Kiwanda Cream Ale, India Pelican Ale, MacPelican’s Scottish Ale, Tsunami Stout and Doryman’s Dark. With the vision, creativity and brewing expertise of founding brewmaster Darron Welch, Pelican Brewing has won over 450 awards including a Silver Medal at the 2016 Great American Beer Festival, 2014 World Beer Cup© Champion Small Brewing Company and Brewmaster of the Year. Pelican Brewing currently distributes 22oz bottles, 12oz bottles in 6-packs, a new mixed 12-pack, and 50 liter and 20 liter kegs via a network of distributors in Oregon, Washington, Idaho, Nevada, Utah, Hawaii and Vermont. The company operates brewing and brewpub facilities in Pacific City, Tillamook and Cannon Beach.